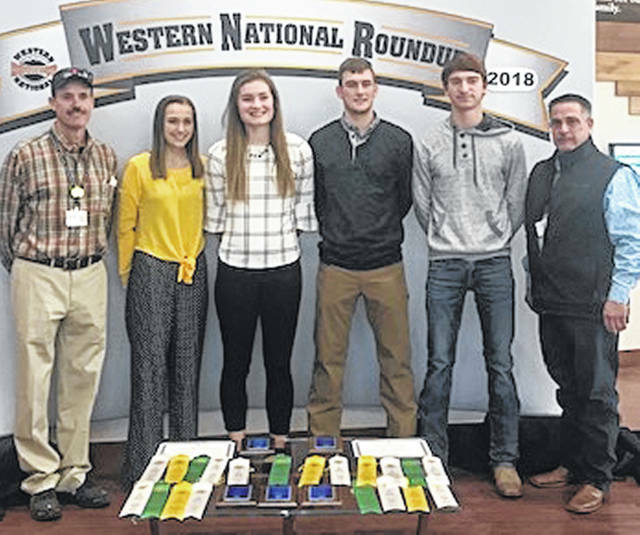 From left are Coach Dr. Bill Ayars, Taylor Ayars, Elly Schipfer, Logan Hurst, Colin Hartley and FFA Advisor Kevin Neer. The Mechanicsburg Meats Evaluation Team competed at the National Western Roundup on January 12th in Denver, Colorado. The team qualified for this event by finishing 2nd in the State last April. The contest was held at Colorado State’s new meat processing facility in Fort Collins. This was actually the inaugural event to be held in this facility. The team had to identify 30 retail cuts of beef, pork and lamb. They also had to identify where the cut comes from in the animal as well as the proper way to cook the cut. Judging carcasses is another part of this contest. The team judged pork carcasses and had to place them correctly as well as answer “blind” questions on the class. Blind questions require you to only use the notes you take on the class to answer the questions. You may not look at the class when answering questions. There were also classes on hams, pork loins, beef rounds, and retail cuts. Beef quality grading was also an aspect of the contest as well as a written test and a beef formulation problem. The awards breakfast was held on Sunday morning, January 13th, at the Colorado State University football stadium at the Smith Alumni Center. The team and individuals were recognized several times. The team awards included 3rd overall team, 3rd place team identifying retail cuts, 4th place team in placing classes and answering questions and 5th place team in beef grading. Individual awards included Colin Hartley being named 9th overall individual and Taylor Ayars 10th overall. Colin and Taylor also received partial scholarships for their placing. Elly Schipfer was 11th overall and Logan Hurst was 23rd. The team is coached by Dr. Bill Ayars To begin the trip the team attended the annual National Western Stock Show parade. This parade is led off with 40 Longhorn cattle walking through downtown Denver. The trip also provided an opportunity to visit the University of Wyoming. A practice workout was scheduled in their meat lab the day before the contest. The team also attended the National Western Rodeo in the Denver Coliseum as well as visiting the famous stockyards of Denver and the rest of the Stock Show facilities. The team also drove past the famous 5 Rivers cattle Company of Greeley, Colorado. This cattle feedlot is the largest in the World as they feed over 100,000 head of cattle. Submitted by the Mechanicsburg FFA.